Is Chairman Menendez the Right U.S. Signal for Latin America? Fresh and credible allegations about U.S. Senator Bob Menendez’s bullying of Latin American governments and influence-peddling for political cronies raise further doubts about what Washington is signaling to the region – and the implications for U.S. relevance in the second Obama Administration. Secretary of State Kerry’s successor as chairman of the Senate Foreign Relations Committee, Menendez is now a major architect of U.S. policy, and his activities and policies are an indication of U.S. intentions around the world, especially in Latin America, which has been the focus of much of the Senator’s attention. Media reports have documented well how Menendez persistently intervened on behalf of a wealthy campaign donor to pressure the government of the Dominican Republic to institute port security programs over legitimate objections of local authorities. When Dominican officials appropriately exercised their duties and pointed out that the donor lacked expertise for the exorbitantly priced contract, Menendez only turned up the heat. This was consistent with an ongoing pattern of behavior. In 2011, according to reliable sources, Menendez demanded a U.S. policy of forcing the government of El Salvador to fire a cabinet minister he did not like, clearing the way for the military to capture the position. Earlier, when the OAS opened discussions on whether to lay out conditions for Cuba’s readmission to the hemispheric body, he threatened to cut all of its U.S. funding. A self-proclaimed champion of “democracy promotion” and “accountability” in Latin America, the New Jersey Democrat never missed a chance to criticize centrist or left-leaning governments. Governments in the region are not the sole targets of his interventions: Menendez has used his influence to intimidate bureaucrats throughout the U.S. foreign policy community into either supporting his initiatives or, at least, turning a blind eye to them. 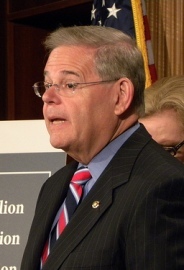 Latin American opinion-makers grew accustomed to Menendez’s ways during his tenure (2010‑12) as Chairman of the Senate’s subcommittee on the western hemisphere, but his ascension to the chair of the full committee from within Obama’s own party makes his voice – and style – much more important. His influence-peddling for his buddies’ business interests – at the expense of other U.S. government and foreign partners’ priorities – can only fuel greater cynicism about U.S. preachiness on anticorruption and “democracy promotion.” It also further risks U.S. relevance at a time that many in the region remain hopeful of a revival of President Obama’s short-lived emphasis on “partnership” in the “neighborhood.” The investigations into Menendez’s activities may run into serious obstacles – many bureaucrats fear his ire, and will be reluctant to talk – but it’s already clear that his bullying and influence-peddling make him the wrong person for a leadership role in U.S. policy toward Latin America.